This review is written to encourage everyone to go see the movie, despite its flaws. It is perhaps the best film on the subject, and I believe it is important to support such films so that movie makers can see there is a wide audience that wants to see them. Currently it holds a 46% at Rotten Tomatoes according to 25 professional critical reviews. The site's critical consensus reads, "The Promise wastes an outstanding cast and powerful real-life story on a love triangle that frustratingly fails to engage." I somewhat agree with this. It is an outstanding cast, with two of the best actors we have today in Oscar Isaac and Christian Bale, and they do not disappoint. The story also is a powerful story and engaging. The love story for me was a bit of a distraction, and sort of takes you emotionally out of the real life events of the Armenian Genocide. Furthermore, though the film does show to a certain extent the brutality of the genocide, in some ways it also was not brutal enough. The good thing about this however is that even children (over 10 perhaps) can see this film, which is important. The film doesn't want the genocide to overpower the love story emotionally, and this is where it lacks its impact as a film on the Armenian Genocide. However, as The Armenian Weekly noted: "The personal connection developed with the characters helps deepen the empathy felt by the audience." This is true, however I just wish it wasn't in the context of an emotional love triangle that brings up its own moral questions. 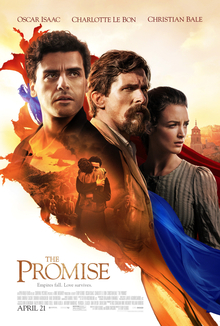 Nonetheless, as one review I read wrote: "The Promise captures the magnitude of this history in a way that no prior film on the genocide has done before. With its sweeping cinematography, powerful acting, and all-encompassing story, it is a truly epic work that effectively and humanely conveys the story of the tragedy." For this reason alone it should be viewed and supported at your local theater this weekend. Another plus - you will never hear references to "Istanbul" in this movie, but you will hear "Constantinople" repeatedly. Though my heart wants to give this film 5 stars, objectively I would give it 3.5 stars. Though not perfect, it is a must see.